Hand painted by oil painters instead of animators, Loving Vincent is designed to look like the work of Van Gogh has come to living, breathing life, and it succeeds. What may be the most beautiful film of the year also looks like nothing we expect from an animated film. It is a moving painting. 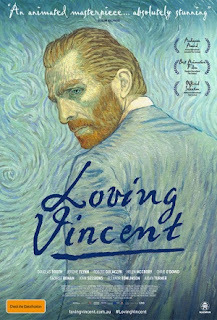 As animation continues towards homogenization, a little film like Loving Vincent is a breath of fresh air and just the sort of thing that we need to breathe life into the genre again. The film tells a charming little story about delivering a letter written by the dead artist to his brother's family. It evolves into quite a compelling little mystery, the veracity of the story I have no idea of. 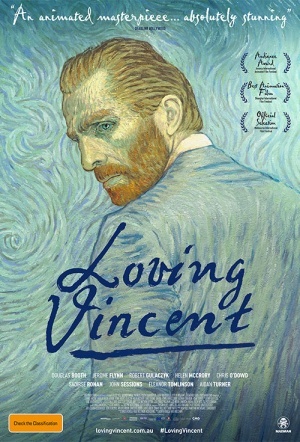 The film sets its scenes within Van Gogh's paintings (for example two characters sit on the terrace depicted in Cafe Terrace at Night and have a conversation early in the film) therefore leading the film to be a way of bringing his paintings to life. 125 painters laboured to paint each scene and the textures, the colours are so rich that watching the film becomes compulsive for the audience. How do you take your eyes away from such a beautiful sight? This is the sort of film which reminds me why I adore animation so much. It is a reminder of what can't be done in live action and why animation remains such a vital part of film making. Loving Vincent is a must see, a film that will stay with you and give you something you won't find in anything else this year.